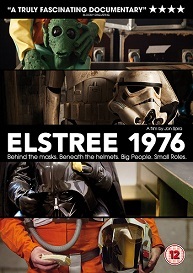 Elstree 1976 is released on DVD November 14th And to celebrate we have a great competition for you and 3 copies on DVD to give away. In 1976, the original Star Wars movie was shot in suburban North London. Nobody involved had any idea how big the film would become, many couldn’t even remember the title. Yet, for the extras and actors in smaller roles, their faces hidden behind masks and beneath helmets, this seemingly insignificant job would go on to colour their lives even four decades later. Documentary filmmaker Jon Spira has tracked down a cross-section of these actors and extras, including David Prowse (Darth Vader) and Jeremy Bulloch (Boba Fett), to find out what it means to have been a part of the most beloved cinematic universe of all time.